It’s true. In the digital economy, there’s constant pressure to do more…right now. But, get away from core processes, and your business can unravel…fast. Take advantage of the power of modern BPM. 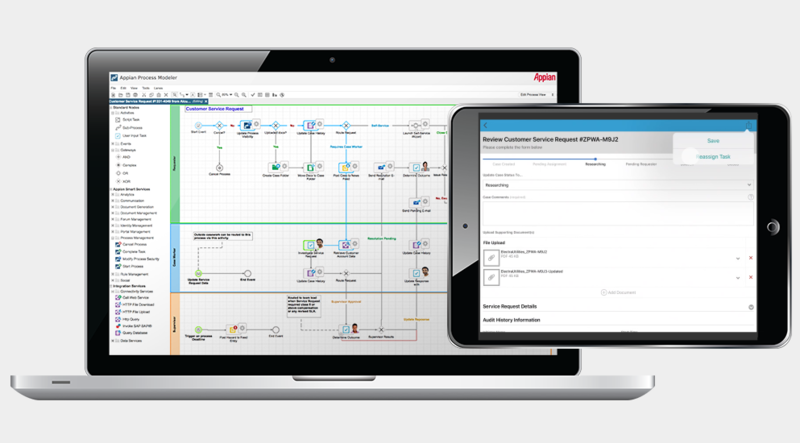 Design, execute, manage and optimize your processes — all with the Appian Digital Transformation Platform. Where do you start with BPM? Create process-based solutions your CEO will love. 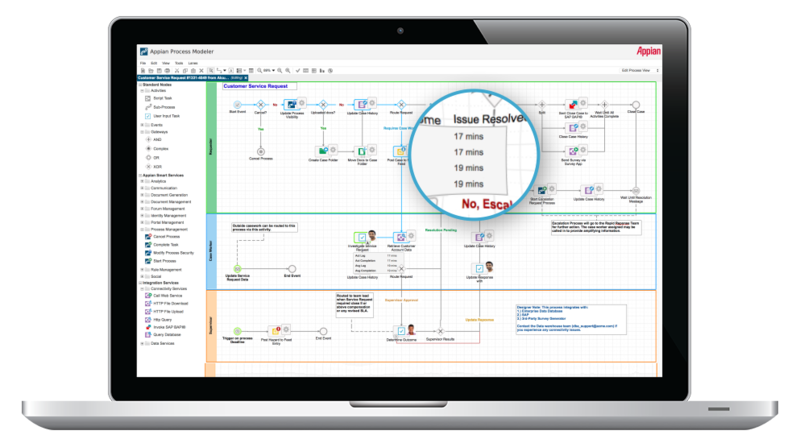 Build processes for apps with BPMN-inspired tools with low-code drag-and-drop functionality. Then, store process models for even faster design next time. Define critical policies and procedures and set them up for replicated success. Track, analyze, and adapt to market demands, business events, regulatory changes, and anything else that may come your way. Rapidly create task forms and dashboards and include them in easy-to-build, easy-to-use user interfaces. 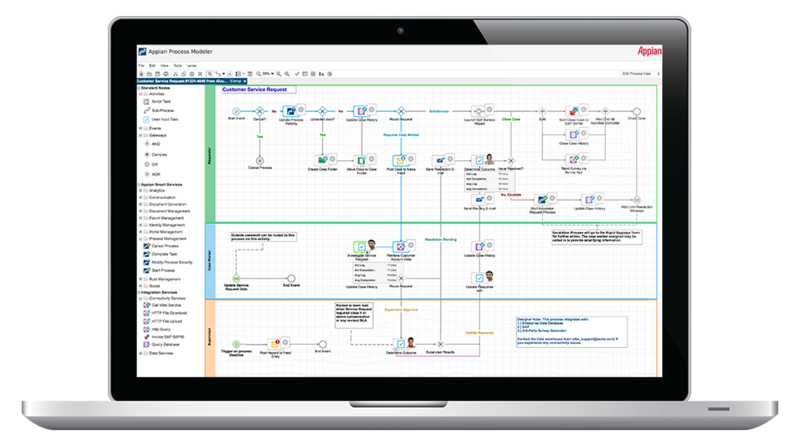 Make your processes come to life...fast. Click it and get your ticket to results. Immediately deploy applications as soon as design is complete. Pre-built connectors and easy-to-configure APIs result in faster integration than you expected. Built-in enterprise mobility delivers responsive, mobile user experiences with no extra work. Create apps that work on any device, natively with no extra time or effort. What does more security certifications than the average bear, combined with unrivaled scalability mean? You feel confident the second it’s deployed. Keep your applications humming and continually meet your goals. Monitor in-flight processes, re-assign tasks, and view performance with real-time process management. Increase worker efficiency and reduce costs with task management capabilities that drive repeated and successful action. Get granular analytics on process and task progress in real-time for proactive awareness. Get the right worker the right task to maximize talent and speed the right action. Proactively identify bottlenecks and inefficiencies and address them before they happen. Apply past performance and burgeoning trends to create self-optimizing processes. Get real-time visibility into business operations. Process. Data. Collaboration. Mobile. All in a single, intuitive platform...in the cloud or wherever you operate. This is Appian. Perhaps your greatest advantage remains largely untapped. It’s the knowledge trapped in the minds of your employees. Uncover it with Appian. One of the greatest opportunity costs? Process and data trapped in silos. Break them down with Appian Records, part of the Appian BPM Suite. 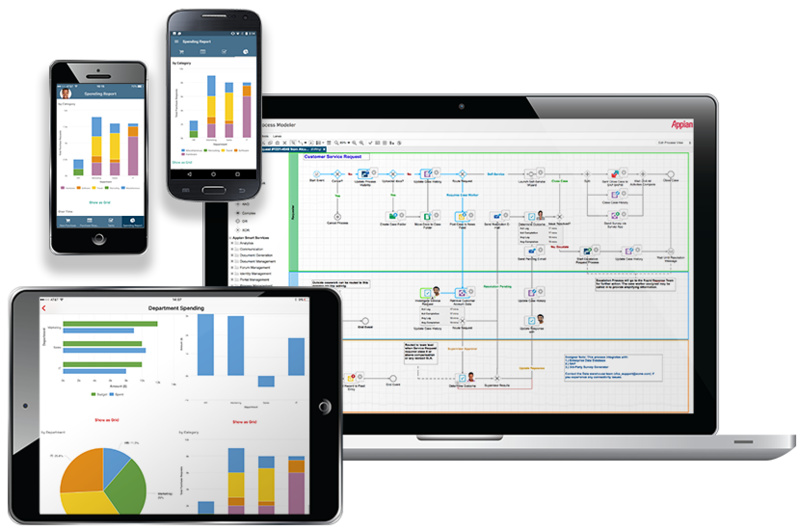 Build apps and access data, tasks, and actions, and collaborate on any mobile device with no additional development time or resources needed.